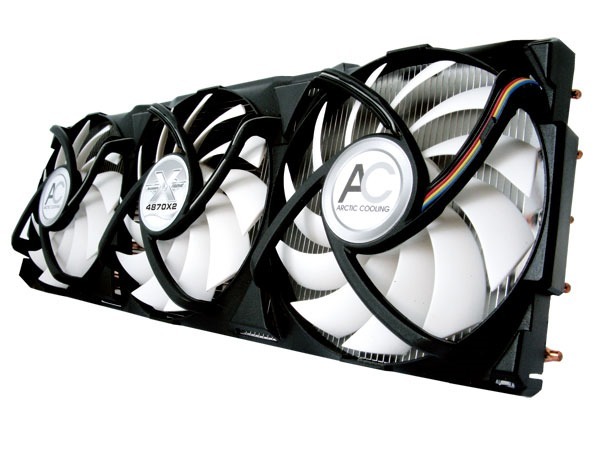 The Swiss low noise cooling solution provider ARCTIC COOLING today announced the launch of the Accelero XTREME 4870X2. Especially designed for the ATI Radeon HD4870X2, the Accelero XTREME 4870X2 follows the sophisticated design of the Accelero XTREME series, offering the best cooling solution for this high-end VGA card. Outstanding cooling comes from outstanding components. The Accelero XTREME 4870X2 is equipped with three 92mm PWM fans running from 1,000 to 2,000 RPM, generating 81 CFM airflow which allows the fans to remove the heat from the two GPUs efficiently. 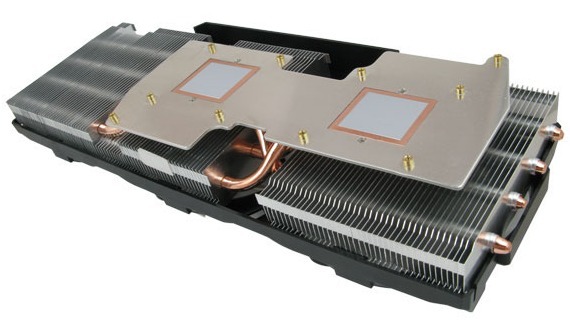 The eight-heatpipe design also improves heat dissipation and achieves 320 Watts cooling capacity. 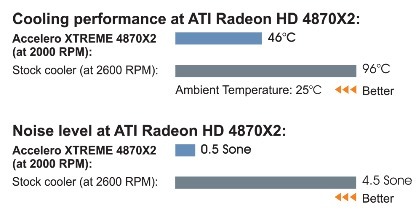 The result is significant – the GPU temperature is 50°C lower than with the stock cooler. This enhances not only the overclock performance, but also extends the service life of your By using the low noise impeller and patented fan holder, the three 92mm PWM fans are incredibly quiet. Also thanks to the PWM function, the fans run just at necessary speed while offering sufficient cooling at the lowest noise level. Even running at full speed 2,000 RPM, the Accelero XTREME 4870X2 operates almost in silent with only 0.5 Sone of sound, creating a much quieter gaming environment beyond anyone’s imagination. The Accelero XTREME 4870X2 comes with a 6-year limited warranty. This product will be available by end of March 2009. The MSRP is US$68.30 and 53.95€ (excluding VAT).